Content relating to prison, prisoners, crime, violence, police, firemen, mailmen, military, etc. Currently under construction, see Main list at S2C for now. For hacks and hacked objects relating to this subject, see: Hacks and Hacked Objects: Vices, Violence, and Weapons. 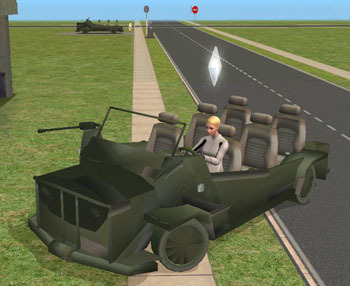 Featured Set: Ready for Army Mini-EP by Katy_76 and smithycpl at Sims2Graveyard, a big set of army related items including driveable vehicles, guns, decorative objects and more! This page was last modified on 26 January 2015, at 01:52. This page has been accessed 215,633 times.